A former brokerage assistant who helped Martha Stewart make her fateful stock trade and later emerged as a key government witness was spared both prison and probation Friday for accepting a payoff during the government's investigation. U.S. District Judge Miriam Goldman Cedarbaum imposed a $2,000 fine against Douglas Faneuil. A week ago, she sentenced the homemaking entrepreneur to five months in prison and five months of home detention for lying to authorities. "I want to apologize for my mistakes," Faneuil told Cedarbaum. "Thankfully, I've learned my lesson." Faneuil had faced up to a year in prison after pleading guilty to the misdemeanor charge of accepting a payoff. But prosecutors recommended no jail time after his testimony helped them secure a conviction of Stewart in federal court in Manhattan. Meanwhile, a "celebrity column" in the New York Daily News reported that Stewart has decided to go directly to jail. "She wants to put this ordeal behind her," a source told the "Rush & Molloy" column. "She thinks that it's in the best interest of her company." Stewart was sentenced to five months in prison and five months home confinement for lying to investigators about a stock sale. Earlier this week, Stewart said she might pass on her appeal and just serve her sentence, or might begin serving the sentence while continuing the appeals process. "My company needs me, I would like to get back to work, I would like this to be over," the domestic entrepreneur told CNN's Larry King in a live interview days after being sentenced. It's a difficult decision for Stewart, says CBSNews.com Legal Analyst Andrew Cohen. "She cannot do what's best for herself legally without further jeopardizing her financial position. And she cannot do what's best for herself and her company financially without limiting the effect of her legal options," Cohen wrote. "She's caught between the counter and the kitchen knife." Stewart, 62, and her stock broker, Peter Bacanovic, 42, were convicted in March of making false statements, conspiracy and obstruction of justice. Bacanovic, who received the same sentence, also was convicted of perjury. Prosecutors had alleged that in 2001, Bacanovic ordered Faneuil to tip Stewart that her longtime friend, Sam Waksal, was dumping shares of his biotechnology company, ImClone Systems Inc. Waksal had advance knowledge of a government report on an experimental drug that later sent shares of ImClone into a freefall. Stewart and Bacanovic always maintained she sold because of a preset plan to unload the stock when it fell to $60 — a claim Faneuil backed before pleading guilty. 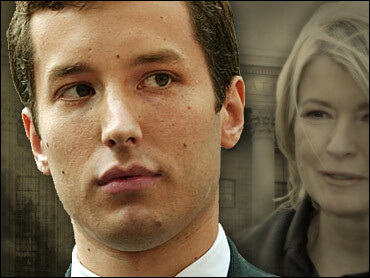 At trial, Faneuil told jurors that Bacanovic, after learning Waksal was trying to sell, told him: "Oh my God. Get Martha on the phone." On orders from his boss, Faneuil said he told Stewart about Waksal, then — on orders from Stewart herself — sold her stable of 3,928 shares, netting about $228,000. The government has contended Bacanovic plied Faneuil with extra vacation time and airline tickets in exchange for supporting the story about the $60 stock order. Faneuil said the broker offered him a week's vacation and a trip to Argentina in early 2002. The defense tried to discredit Faneuil as an admitted drug user and a liar. Lawyers used e-mails to show jurors he had a spiteful fixation on Stewart while he worked at Merrill Lynch & Co.
After handling a call from Stewart, Faneuil told a friend in an e-mail: "I have never, ever been treated more rudely by a stranger in my life." Three days later, he wrote to another friend: "Martha yelled at me again today, but I snapped in her face and she actually backed down! Baby put Ms. Martha in her place!!!" Both Stewart and Bacanovic are free pending appeal.